SLP's Air Temperature Module: Is this a overpriced $0.50 resistor? Is this an overpriced $0.50 resistor? I was sitting around reading SLP's website and came across their air temperature module for the LS1 Camaro. SLP claims a one to two degree timing advance and a possible five to seven horsepower gain. All of these claims come from a simple device that is connected in line between the intake air temperature (IAT) sensor and the wire harness. Something similar has been around for several years now. Many people were trying to achieve the same claims by inserting a 4700 W, ½ watt resistor in the wire harness that connects to the IAT sensor. This made the PCM read 57 °F for the intake air temperature. 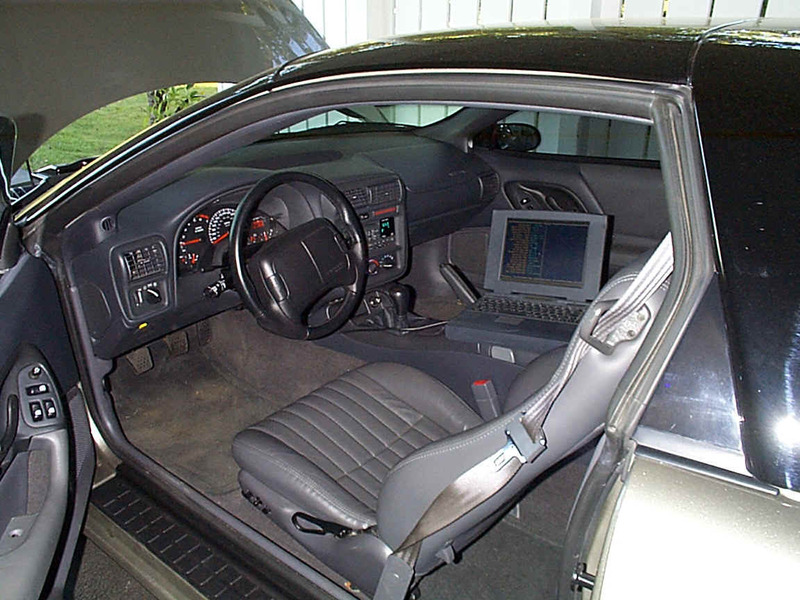 The idea behind this was that 57 °F makes the car's computer, power control module (PCM), adjust for the best timing advance giving the most horsepower possible. This idea is known as the "timing tricker" modification and has had mixed results. Some people have reported losing time at the track and horsepower on the dyno. Others have had good success by picking up speed/time and horsepower on the dyno. That is what made the air temperature module so interesting to read when I came across the product on SLP's web page. It made me wonder if this air temperature module was just an over-priced 4700 W, ½ watt resistor. After all, there is only one thing you alter with the IAT sensor, the temperature. What does the Air Temp Module do? After a quick thirty-second install, I started Auto Tap and took the reading of the IAT sensor. The IAT sensor was reporting 36 °F. This is not the 57 °F that the timing tricker modification forces but the same idea is at work. Instead of 57 °F that current Camaro owners achieve with the 4700 W, ½ watt resistor, SLP has their unit set to make the PCM read 36 °F. SLP engineers found that this temperature was the best for the LS1. The gains are accomplished by tricking the PCM into thinking the temperature of the incoming air is 36 °F. This advances the timing and will supply a few more horsepower for your car. At least this is the idea behind this modification. The next step was to get out and test the module to see if it lived up to SLP's claims. I do not have a dyno readily available to prove the horse power claim. I do have Auto Tap and can see if the timing is increased by the claimed one to two degrees. The six speed Z28 had the following performance modifications installed at the time of this test: Whisper induction lid, exhaust cutout, hypertech power programmer three, and the EGR delete modification (!EGR). Two base line test runs were made before the SLP unit was installed. Below is a table that lists the averages of the knock retard and timing advance from each gear from both of the test runs. The 1.4 degrees of knock retard that was noted in test run two happened over an isolated rough section of road that was avoided on the last two runs. We are confident it was false knock from the road. After the two base line tests were made, we installed the SLP unit. Below is a table that lists the averages of the knock retard and timing advance from each gear from both of the test runs. The baseline tests that were made before the SLP unit was tested gave good results. We averaged around 28 - 29 degrees of timing advance and almost zero knock retard. The test runs after the SLP unit was installed showed an immediate increase in knock retard. This offset any hope for any timing advance increase and would only result in horsepower loss. In all fairness to SLP, they have manufactured a very professional piece. The unit does not cause any alarm or seem out of place when inspecting the IAT sensor. This is exactly the kind of thing you want when taking your car into the service department of your dealership. The less questions the better and SLP has achieved that. However, before you spend $25 for the professional looking unit from SLP, test out this modification for yourself to see if it is going to be beneficial to your car. Every car is different and I am as sure as the day is long that there will be some cars this is successful on. After fitting known resistance against known temperatures the resistance causes, I was able to fit the data using an exponential equation. This resulted in finding out what resistance was needed to produce the 36 °F IAT's. We measured the resistance of the SLP air temperature module and found the resistance to be 8120 W. Therefore, a 8100 W, ½ watt resistor would replicate the SLP unit. There are people on e-bay selling timing trickers, timing chips, or resistors (they have many names for them) between $2 and $20. They are referring people to this website for install instructions and in some cases saying that IU.com is selling the product. We do not sell anything on this website! We also would like for everyone not to purchase the resistor because it is a WORTHLESS mod that does not work. The e-bay sellers are ripping you off, especially since you are buying a $0.23 resistor from Radio Shack! Please do not email us asking about the IAT (intake air temperature) sensor because will not respond to those emails anymore. There will be a bigger announcement placed on our IAT tricker page and more information to come as we will list the sellers that we know of doing this to help protect all car enthusiasts!